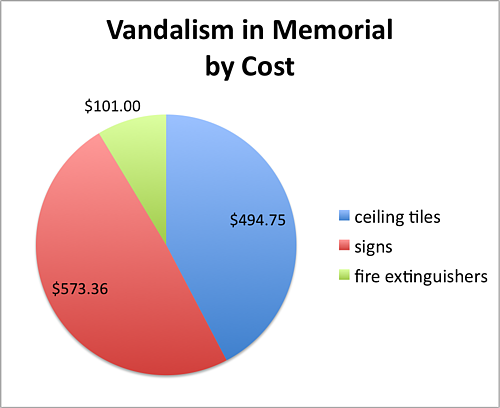 Since Memorial Hall first stood in fall of 2009 there have been numerous accounts of signs stolen, fire extinguishers discharged on non-fire occasions, and burnt cookies (unrelated). Residents of Memorial received an email on April 27, 2010 indicating that all the occupants would split the charges equally for vandalism that occurred during winter and spring terms. Damages totaled more than $900, causing some residents to complain about fines that they deemed to be unfair. Three signs were stolen or broken, two fire extinguishers were discharged, and six ceiling tiles in the halls and elevator were broken. The most expensive cost, however, was a broken exit sign and surrounding ceiling tiles, totaling $300.18. Another exit sign cost $196.18. The lesson here: if you’re going to do damage to a public space, make sure that it’s not in your own building. Eventually, someone is going to have to pay for it. Who says it's a Memorial resident doing the damage? Anyone has access to the signs, right?